Oracle today announced Oracle® Business Intelligence 11g, the most complete, integrated and scalable suite of Business Intelligence products for customers to achieve better business visibility and alignment. Enhances performance, scalability, and security through deeper integration with Oracle Enterprise Manager 11g and other components of Oracle Fusion Middleware. By extending capabilities in the Common Enterprise Information Model, Oracle Business Intelligence 11g is the first solution that unifies Relational OLAP (R-OLAP), Multidimensional OLAP (M-OLAP) and enterprise reporting on a common technology foundation. Enhanced OLAP analysis capabilities enable users to access and navigate hierarchical data stored in Oracle Essbase and popular relational data sources from a common interface. 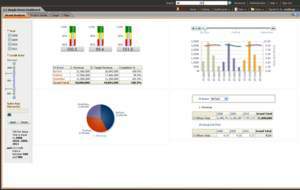 A new, integrated thin-client report design editor enables business users to publish both interactive, Web-based reports as well as high fidelity, pixel perfect production reports. A new application, Oracle Scorecard and Strategy Management, is an integrated component of Oracle Business Intelligence 11g that helps individuals track metrics and key performance indicators (KPIs) that align with organizational strategy and goals. 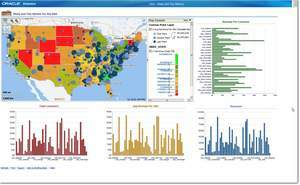 The enhanced, task-oriented user interface features a comprehensive range of new interactive charting and prompting capabilities, including map visualization options directly linked to spatial data, to provide a richer, more intuitive end user experience. The Action Framework feature is a unique and innovative feature that closes the loop between insight and action by enabling users to initiate an action, such as a business process or Web service, directly from their dashboard. End users are notified of exceptions and events, share and discuss insights in real-time, make decisions collaboratively, and save annotations and discussion threads through built-in notification and alert features as well as integration with Oracle WebCenter Suite 11g. New integration with Oracle Secure Enterprise Search enables casual users to quickly and easily find relevant reports as well as views and metrics within reports, in line with access and security parameters defined within Oracle Business Intelligence 11g. The addition of Oracle Hyperion Financial Management as a supported data source, in addition to enhanced support for Oracle Essbase, extends Oracle's Enterprise Performance Management (EPM) System integration. Oracle Business Intelligence 11g is the technical foundation for Oracle's EPM System as well as Oracle BI Applications -- the complete, prebuilt analytical solutions for Oracle and non-Oracle applications, including SAP. Through deep integration with Oracle Enterprise Manager 11g, Oracle Business Intelligence 11g is the only BI foundation that allows system administrators to manage and monitor BI performance from the same environment used to manage their entire IT stack. The integrated system management services of Oracle Business Intelligence 11g make it easy for administrators to quickly configure, test, deploy, monitor, and install patches to enable continuous availability, with superior security, scalability, and query performance. The enhanced Common Enterprise Information Model provides high performance, federated queries against hundreds of data sources in relational, OLAP, and XML formats. Existing Oracle Business Intelligence customers running earlier releases can upgrade to this new release quickly and easily without impact to existing reports or metadata migration. "Oracle Business Intelligence 11g delivers the complete spectrum of business intelligence capabilities, spanning enterprise reporting, scorecards, dashboards, ad hoc queries, OLAP analysis, search, and actionable collaboration on an integrated technology foundation," said Paul Rodwick, vice president of Product Management, Oracle Business Intelligence. "The new release is easy to implement for departmental needs, and scales to provide unrivaled performance and scalability for the largest and most demanding enterprise deployments." "We've had a lot of success with Oracle Business Intelligence 10g, and Oracle Business Intelligence 11g will build upon that success," said Mike Blackmore, Enterprise Architect: Oracle First, BT Innovate & Design. "The new scorecard and KPI facilities it provides as well as the ability to embed BI within business processes are the features that are drawing interest within BT. The ability to combine, analyze and then act on data, is going to help BT a great deal." 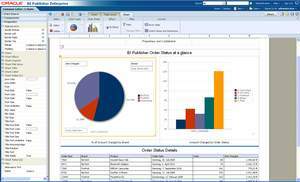 Download free evaluation version of Oracle BI software. Terms, conditions and restrictions apply. "THIS DOCUMENT IS FOR INFORMATIONAL PURPOSES ONLY AND MAY NOT BE INCORPORATED INTO A CONTRACT OR AGREEMENT"
Oracle Business Intelligence 11g delivers a richer user experience and interactivity through new data visualization and analysis enhancements spanning new chart types and features. This screenshot of Oracle BI Interactive Dashboards features filtering, a pie chart and slider (from left to right). Through integration with Oracle Spatial 11g, Oracle Business Intelligence 11g enables organizations to integrate BI with existing business and operational data via geographic maps to help gain insights through spatial visualization. This screenshot shows a business's state and city revenue metrics plotted over a map of the United States. Graphs highlight Total Revenue, Total Customers, Revenue by Customers and Average Revenue per SKU. Oracle Business Intelligence 11g features a new, integrated thin-client report design editor within Oracle Business Intelligence Publisher that enables business users to publish both interactive, Web-based reports as well as high fidelity, pixel perfect production reports.